Note: The release date was given erroneously as February 3, 1911 in the February 4, 1911 issue of The Billboard. "When Mrs. Gage's little savings were swept away and she found herself penniless, she naturally turned to her only son for support. Unfortunately for her, the son married and his wife objected to the introduction of a mother-in-law into the household. At first her objections were overruled, but after the unwelcome guest had been domiciled with them for some time, she induced her husband to send his mother to a home for the aged. But in the meantime, the sweet-faced old woman had won a firm friend in the person of her little granddaughter Marie, who found 'Granny' to be just the friend that she needed, and when the old lady was sent away, Marie refused to be comforted. 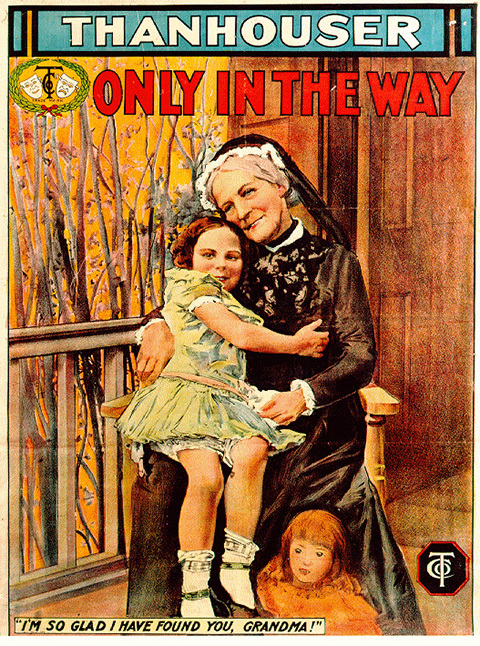 'Granny's' only fault seemed to be that she was more or less helpless, and little Marie was a cripple. If a good woman like 'Granny' could be treated that way, the child argued, what could she expect? And so the little one decided to run away, what was more natural than that, she should go to the other person who, like herself, was 'only in the way?' So after leaving a farewell note she started. Her childish note of farewell touched the hearts of her parents. Their selfishness was brought home to them, and when they found the two helpless ones together and happy in each other's love, they did not have the heart or desire to separate them. From that day on neither of them was 'in the way,' and, best of all, they were made to feel it." "Here is a sweet story in which a child effects an old grandmother's return to the house of her parents after the young wife has caused the old lady's removal to the old ladies' home. Pathos has been injected into this film in large quantities, and the character of the child is such that it is bound to appeal. The little actress deserves special mention for her ability. The photography is very good." "This theme is getting threadbare; a foreign film is almost identical. The son's wife acts brutally to her husband's mother; things are set right by a child. Compare Gaumont's Twilight of a Soldier's Life, etc. The acting of the child is charming, and of the old lady a womanly concept - even to details. The wife's grabbing the old lady's bag, umbrella, etc. was, as one said who sat next to me, 'a bit too rushed.'" "Sometimes the motion picture arouses recollections that are anything but pleasant. Here, for instance, is a development of a domestic tragedy which has its counterpart in numerous homes, and probably more than one in every audience will recall similar incidents within the circle of their own acquaintance. When this is a fact it will be recognized that the producer has reproduced actual situations with singular accuracy. The part played by the grandmother and the one played by the child are both pathetic and cannot fail to touch the heart. The person who can sit through this and not feel the tears welling up to his eyes is strangely callous to human grief and emotion." "The way this picture is handled deserves especial praise; it might have been so easily spoilt in acting and telling. One could really get the point of view of the wife, who might have been made in other hands somewhat of a hard-hearted, jealous shrew. At the same time one is able to feel sympathy for the mother. When this old lady came to live with the family, the wife, filled with the care of her lame little daughter, felt that the task was too much for her, so she had the old lady sent away to the old ladies' home. The little daughter, who had grown very much attached to her grandmother, wrote a note to her parents saying she, too, must be in the way, and was going to live with the grandmother. The parents found her there and brought the old lady back with them. It was noticed that the old lady's bag was brought on immediately, already packed, when she left the son's house and when she left the home. It looks planned beforehand - similar incidents have hurt the excellence of a number of this company's superior films. It would take time in life, and a split in the film would have done it. Such things spoil the illusion to a spectator. As seen from the theme of the story, there is chance for delicate conflict of emotions, and it is well expressed by actors and management." Modern Synopsis (From surviving print in the Library of Congress) This is given in the narrative section of the present work.